As soon as Sammi (aka BeautyCrush) announced her and her bf Jason were bringing out a clothing line, I knew I needed it in my life! I've always admired Sammi's style and so I knew Novem & Knight would be brilliant. When the promotional shots came out I had my eye on the striped 'Bardot' dress, and was on the site as soon as it launched. Four minutes later, I'd bought it and it was on its way to me! I couldn't wait to get a blog post up all about it as this actually sold out on the launch day, so if you're thinking of picking it up when it comes back in stock, here's my thoughts on N&K. Firstly, the material of this is fantastic. Despite it being white, I can confirm it's not see through at all, and the material actually feels really thick. It reminds me of polo shirt material - not sure if it is or not but definitely feels like it. This kind of material also makes it breathable too - great for summer! All their manufacture and materials come from the UK too, so you can be rest assured it's been made in a safe environment and the quality really is great. The dress is pretty short - I would say it hits mid thigh on me and I'm pretty average height (5"5, 5"6 ish). That's really my only gripe with it, as I definitely feel like I have to wear tights with it being so short! 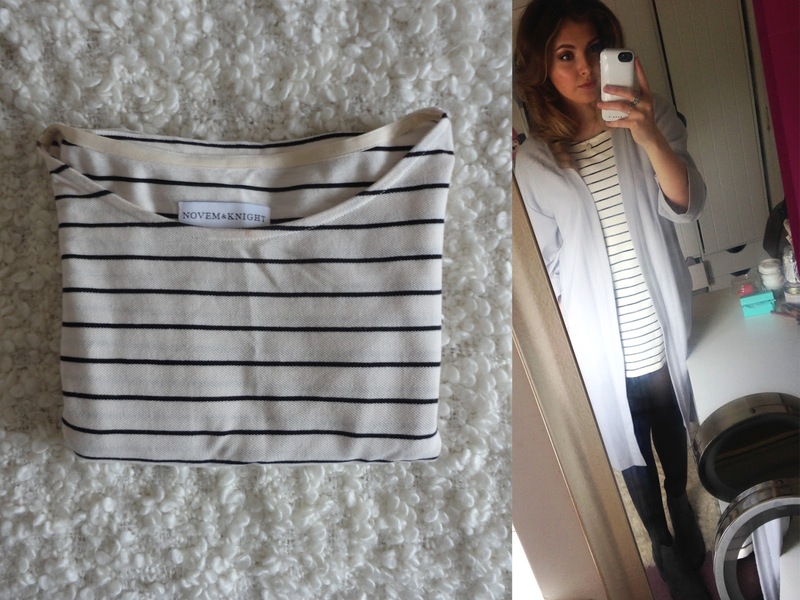 I also wore it here with a longer duster style jacket (from Topshop) so that made me feel better about the length too. I would maybe wear it without tights on holiday or something, but other than that I'd stick to tights. Although, Sammi wore it here without tights and she looks fabulous - so maybe I just need to work my legs at the gym more to get to that stage haha! Overall though, I'm really impressed with the brand. I love how everything is minimalistic and so can be styled multiple ways. I also think the mens clothing is fantastic, and definitely something my bf would love. The pieces may be considered more of an 'investment' piece with the prices being slightly higher, but all the pieces are staples to any wardrobe so you can guarantee you'll get your wear out of them! What do you think? Have you picked up anything from Novem & Knight yet?